The Chickens: When we moved to the property in early 2011 it broke my heart to walk past the beautifully constructed, but definately worn down chicken coop my grandfather had built many years ago. One day I found myself pulling in to our old feed store and low and behold they had some chicks in stock! Next thing I knew I was driving home with a couple of baby Rhode Island Reds in a cardboard box and a 50lb bag of chick starter in the back seat. My children proceeded to name them: Bubbles, Butter, Bubble and Star. Despite my protests, the names stuck… thankfully now we have too many hens who look alike so my kiddos have no clue who is who anymore! Maxine: We received word a few weeks after moving in that there was a pregnant Nubian-Boer cross who needed our help out in Borrego Springs. My grandmother volunteered us happily. The intent was to get her and bring her home BEFORE she delivered her babies, however due to one rather cold evening she delivered triplets before we could get up to her. A few days after their birth I had my grandma hop in my SUV with her big straw hat and giant sunglasses we drove two and a half hours up the mountains (getting lost only twice) to Borrego. We arrived just in time to witness the birth of another set of babies, my grandmother was in heaven. Then we loaded maxine in the back of my trailblazer and gently placed her newborn babies in a dog crate and drove home. Maxine is an amazing mother and a GREAT milker! Ten minutes of milking and she produced almost 2 gallons of milk for me, on top of whatever those growing triplets were taking. Despite having been raised with horses she developed an understanding for how her new living arrangements were going to work: people = treats! She soon became eager to call for our attention and happily searched our palms and pockets for food. Munch-Munch: Yet, another casualty of my children naming an animal… the irony is that they never knew I was actually considering eating him! Poor Munch-Munch was fired as a daddy bunny after the second batch of babies he made where almost all had genetically inherited his pink eyes. No one wanted to buy them as pets and I even had a hard time finding anyone to take them for their meat, so he was fired and we brought in a new daddy. While deciding whether or not to eat Munch-Munch we aquired some orphaned chicks so out of curiousity I happened to set them in the cage with our lonely daddy bunny and ya know?! He snuggled right up to those baby chicks and loved on them all night long! Munch Munch You’re hired! 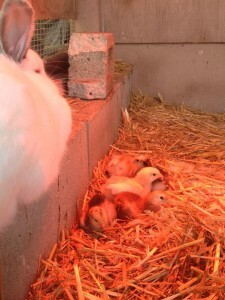 He is now our adoptive mommy for our baby chicks and he loves every minute of it! Geezer: I am not sure why I decided to search for pigs, but I did. 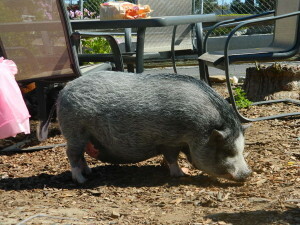 I found a wonderful Pot Belly Pig Rescue and contacted the woman who ran it. She emailed me back quite quickly and we discussed the property and space available for the pig and our family dynamic. She got back to me shortly after with a couple suggestions but strongly recommended a little guy named Geezer. 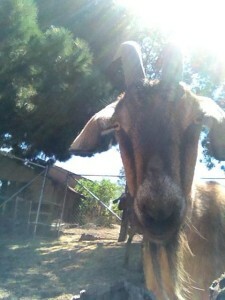 Geezer had been a personal pet to a wonderful woman from Long Beach. She loved him like a baby, lathering him up with lotion every night and letting him in the house to sleep by her feet as she worked at her desk. 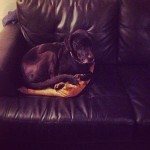 I am convinced he thinks he is a dog. Geezer was transported here and spent a few weeks adjusting to his ‘outdoor farm life’ but now is a happy-go-lucky farm pig who loves to chase the chickens, wags his tail, sings and squeals when his favorite people come visit and of course: begs for treats. 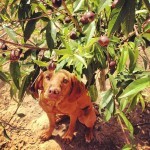 He has been a wonderful addition to our farm. 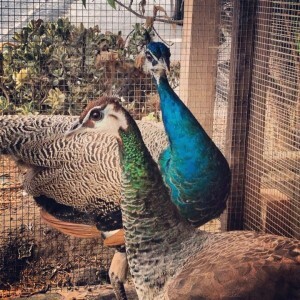 Astro and Trixie: The newest, and I believe the loudest, additions to our farm have been this beautiful pair. Astro is a young male Peacock and Trixie I believe to be an older female Peahen. After a few quiet weeks adjusting to their new surroundings in a comfortable flight cage my grandfather had built for my grandmothers overflowing cockatiels and love birds I let them out to explore their surroundings. Trixie adjusted rather quickly; slowly exploring the yard and sunbathing by the bushes. Astro however was a bit more unnerved by the whole transition. The poor guy would make a mad dash for cover any time a crow or even a dove flew overhead. I joked that he could pass for a roadrunner more so than a Peacock… however, I am pretty convinced he’s much better at frantically running in figure eights than a roadrunner would have been. He tends to lose track of his woman all too often and flys to the highest place crying for her… and in typical woman fashion she tends to ignore him and go on about her business not paying any attention to his ridiculousness. Although I loved seeing their sillouette in the pine tree in the early morning sunrise, I did not appreciate the 5am dying cat calls outside my window… SO Astro and Trixie have been banished to their original quarters in the flight cage just in the evenings and allowed out later in the morning… when I (and the neighbors) dont mind the noise. 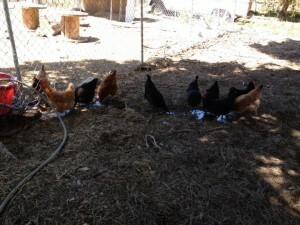 I am convinced they dont mind it too much, considering Trixie has begun laying her eggs in there each night now…. Do we have some new babies on the way?? 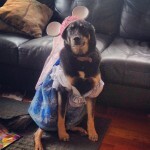 The Dogs: It seems we have a revolving door when it comes to the number of dogs in our home. However, THREE of the dogs, no matter how many more we feed and care for, belong to us…any more than that are just fosters. Hanna and Bailey are muts. Hanna is supposedly a black lab mixed with Dalmation but the only white on her is her old lady grey hairs (trust me, I am not judging). We joke she is part greyhound because she is incredibly skinny and loves to run. Bailey is only a couple months younger than Hanna, but is happily fat and fluffy. She is a Shepherd mix and in her grumpy old age she thinks she needs to boss the others around anytime too much excitement is going on. She is a total love bug and would be perfectly happy in the house being spoiled by the girls instead of playing fetch with the others out back with my son. Last but not least is the baby of the bunch: Greta. This lively little ball of fire was born on Halloween of 2012 and is living up to every ounce of her name. The Greta who preceeded her was just as spunky and determined of a dog. Smart as ever and such a wonderful loving companion for my son. She is at that gawky goofy stage in her development right now but I can see what a beautiful dog she will become, now if I can only get her to stop eating my walls!